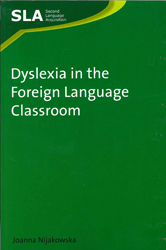 Dyslexia In The Foreign Language Classroom - ubiq bookshop: the best place to buy books! This book addresses specific learning difficulties in reading and spelling - developmental dyslexia. Set in the cross-linguistic context, it presents issues surrounding dyslexia from the perspective of a foreign language teacher. It is intended to serve as a reference book for those involved in foreign language teaching, including experienced in-service teachers and novice teachers, as well as teacher trainers and trainees. It offers an up-to-date and reader-friendly study of the mechanisms of dyslexia and an overview of the current research on the disorder, in theoretical and practical terms. Its aim is to help teachers tackle one of the many challenges they face in the modern classroom: the organization of an effective foreign language teaching process for students with dyslexia. Featured in the November 2011 Education newsletter.